This week, the UC San Diego baseball team faced off against California State University, Dominguez Hills in its 10th week of conference play. In the four-road series, UCSD swept Dominguez Hills, winning all four games. After this week of play, the Triton’s record advances to 34–15 and 27–13 in conference. In the first game of the series, the Tritons pulled off a close 2–1 victory in a low-scoring affair. The game was kept scoreless up until the fourth inning where UCSD earned 2 runs from 2 hits. Stolen bases were essential to this scoring run. 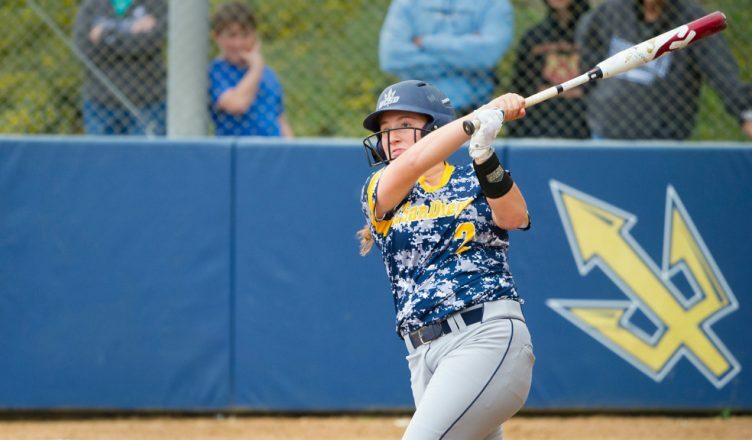 After hitting a single through the right side, senior outfielder Kelsi Maday stole second base, and then eventually advanced to score. Sophomore pinch runner Danielle Stedman — substituted in for fellow sophomore first basewomen Brittney Ross-Smith who just singled to first — stole second and third base and then scored. The Tritons were able to keep Dominguez Hill scoreless until the bottom of the seventh and final inning. Freshman pitcher Robyn Wampler had a field day against the Toros, striking out half the players who came up to bat (12 strikeouts on 24 players at bat). Though the Toros outhit the Tritons (recording 5 hits compared to the Triton’s 4 hits), UCSD was better at converting its hits into runs. UCSD followed up its first victory with another win, defeating Dominguez Hills 9–3. Like in the first game, both teams were kept scoreless until the fourth inning, when the Tritons scored three runs. Three triples hit by junior shortstop Maddy Lewis, freshman first basewoman Bobbi Aguirre, and sophomore right fielder Mikaila Reyes, highlighted the first scoring run. Though they were held scoreless in the fifth inning, the Tritons resumed scoring in the sixth inning. Maday homered to center left with Lewis at first base, earning the Tritons 2 points. The Tritons closed out the game in the seventh inning with four more runs off of three hits. With the help of a double hit by freshman designated hitter Sherriah Harrington, Stedman scored one of those runs. Aguirre homered to right center with two runners on base, netting UCSD 3 points. With Dominguez Hills unable to score at the bottom of the seventh, the Tritons ended their second game on top: 9–3. The Tritons continued to dominate the series, winning 7–1 in the third game. UCSD got off to a hot start in its third game: 4 runs off of five hits at the top of the first inning. Harrington, Aguirre, Lewis, and senior second basewoman Kendall Baker scored one run each. UCSD was never able to replicate its first inning scoring drive (2 runs in the third inning and 1 run in the sixth inning), but its strong performance on defense kept Dominguez Hills from catching up. Wampler had another fantastic performance, recording 10 strikeouts and allowing only 4 hits. In their final game of the series, the Tritons continued to control the game, defeating the Toros for the fourth time: 8–1. Much like its previous game, UCSD got off to a fast start, scoring 5 runs off of 4 hits. Aguirre homered to center field with Lewis earning 2 runs total. Maday homered to left center with Reyes on second base and freshman right fielder Isabel Lavrov on first, getting 3 more points for the Tritons. UCSD went on to score two more times: 1 run in the fourth inning and 2 runs in the seventh inning. Compared to game 3, the Tritons were not as dominant at the mound: three strikeouts and 8 hits allowed. UCSD’s performance in the field was what kept Dominguez Hills from earning more than 1 score. Aguirre led the team with 10 putouts; she was trailed by senior catcher Lauren Sanders with 4 putouts and Baker with 3 putouts. With the completion of this series, the Tritons finish their 2018 regular season. Next week, marks the beginning of UCSD’s post-season run. The team will head to Bill Simoni Field in Stockton, CA to play in the California Collegiate Athletic Association Tournament.